Gardeners who are inexperienced or who have little time to work in the garden are especially fond of roll out flowers. They simplify the entire process of seed germination and planting. Some roll out flowers include a variety of plants. One preseeded garden might include cornflowers, daisies, baby's breath, candytuft, sweet William, calendulas, godetia, stock, annual phlox, and black-eyed Susan, for example. Others include only annual seeds, only perennials, a wildflower mix, or some other special collection. There are many kinds of collections to choose from. Seed mats are made of biodegradable materials -- usually some kind of wood fiber -- with seeds embedded into the mat itself. They are available in a variety of shapes and sizes, from ten-feet by ten-inch rectangles to circles three inches in diameter. Most seed mats can be cut into other shapes with a sharp knife or large scissors. Mats can be purchased for both flower seeds and vegetable seeds. Sometimes moisture retaining granules and/or fertilizers are included as well. Roll out flower mats are usually prepared with a mixture of flowers that can all be grown under similar conditions -- full sun or part shade, for example. Often, the flowers will be chosen so that they do not all bloom at once, giving the gardener a full blooming season and a variety of flower shapes and colors. A seed mat provides a favorable environment for seed germination. It also acts as a light mulch, inhibiting weed growth and retaining moisture. Seed tapes are long, narrow strips of tissue-paper-like material. They are filled with evenly-spaced seeds. When wet, the paper-like material keeps the seeds moist for germination. Soon afterward it will disintegrate, leaving the seeds perfectly placed in a garden row. Seed tapes are a particularly good choice for tiny seeds that are difficult to sow evenly. The 'paper' prevents hungry birds from eating seeds and also keeps seeds from being washed away during sudden heavy rains. Most seed mats and seed tapes should not be started until the soil is warm and all danger of frost has passed. Prepare the seed bed. 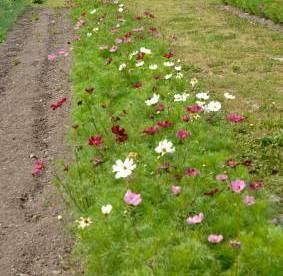 Roll out flowers do not need the soil to be as thoroughly prepared as ordinary seed beds, but some preparation will make the garden grow better. Remove weeds (or grass, if you're making a flower bed in the lawn). Loosen the soil with a shovel, and rake it smooth. Remove any rocks or large clumps. Moisten the soil and unroll the seed mat. The mat or tape should rest right on the moist soil. Leave three or four inches of bare soil between the edge of the roll and the walkway, lawn, etc. If you're using a seed tape, cover it with a very thin lawyer of soil, about one-quarter inch. Water immediately. This should be a long, gentle watering. When you have finished, the mat should be molded to the shape of the ground. You shouldn't be able to lift the mat in one piece. Keep the mat evenly moist until the seedlings appear. Most mats include some quick-germinating species, so you will usually see seedlings within a week or ten days. As the seedlings grow, reduce the frequency of watering. Water very thoroughly when you do irrigate. You're encouraging the roots to grow deeply into the soil.